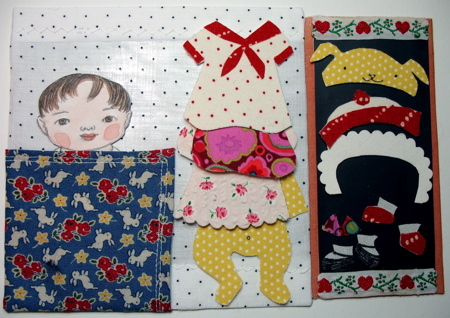 I’m working on my paperbag swag for March- it’s gonna be a little late. 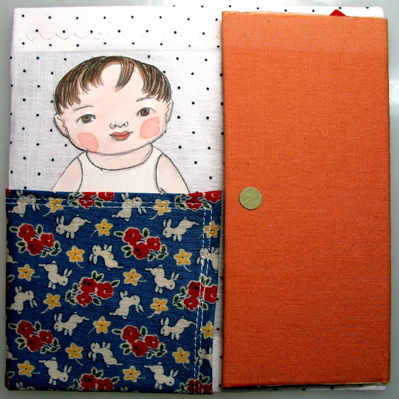 I am working on Ellia’s book. A fun part of participating in a project like this, is that it gives me a chance or a place to try out ideas, techniques, materials, that don’t seem to fit in with the regular artwork I’m doing. Well, I was having a great time playing with her anyway! 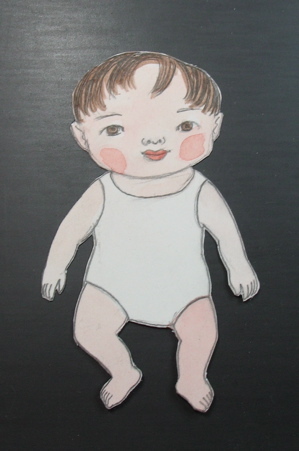 It made me remember paper dolls of my childhood. I remember a drawer full. I liked cutting them out. I liked trying on the dresses. I didn’t like the tabs though- frustrating to cut and they didn’t really hold the dress on. 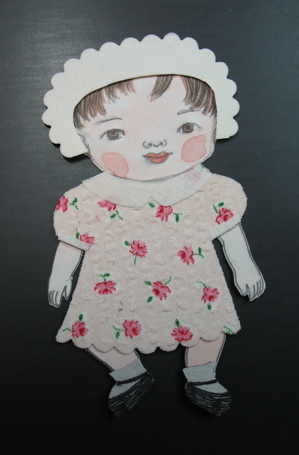 Then they got put in the drawer where they got wrinkled and mixed up with other paper dolls and all the clothes and what a mess! I don’t think I ever played with them more then once each. 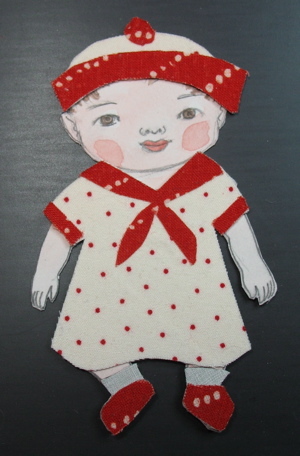 This entry was posted in doll, finished projects, General, paperbag swag book, progress report by mimik. Bookmark the permalink. I too had (and still have actually!) 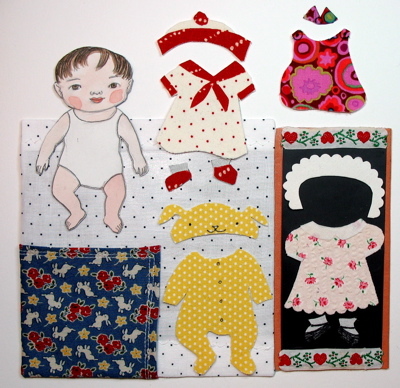 a grand collection of paper dolls that my sisters and I played with for hours. One particular set actually came with holes in their bodies and their clothes and we would attach their clothes on them using yarn. Good times. The magnet idea is great and the fact that you can utilize real fabric certainly adds a new dimension to the whole thing. Fun stuff! I love these! So funny! I love how the baby’s head is nice and big and so happy and friendly. This series really made me smile. Oh that is amazing! I have got to look out for that stuff. Love the outfits and the blanket. Tutorial? More making hours in the day? the baby is the cutest, and her garments are the prettiest. what a sweet baby is that! I love his bunny-eastern-outfit! It makes me feel springtime! OMG – childhood memoris! 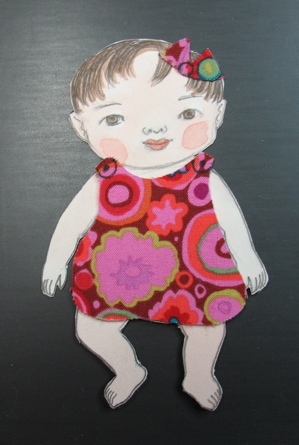 I LOVED paperdolls but had the same frustrations with the clothes falling off! We mayhave to make the magnetic version over spring break!! Your baby doll is just precious!! This is wonderful Mimi! I love how each outfit gives her changes her personality. 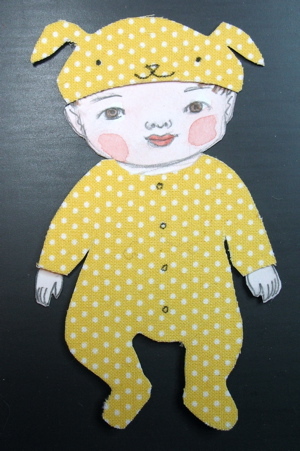 I love your dolls, and this paper doll is the cutest ever!